From Space Shuttle docking speeds to distance and speed measurement on our highways, Laser Technology, Inc. is redefining the way you measure your world. 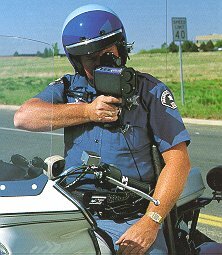 Now, the company that pioneered the first laser speed detector introduces a next-generation traffic safety tool. The LTI 20-20 UltraLyte. The UltraLyte takes all the best qualities of earlier LTI models--laser sharp target selectivity, instant speed readings, rugged reliability--then incorporates product enhancements based on years of field experience with officers worldwide. The result is a smaller, lighter laser that sets a new standard for versatility, capability, and ease of use. Weighing less than 3 lbs. and compact enough to fit in a motorcycle bag, the UltraLyte operates comfortably in one hand. Its one piece, aluminum housing is shock-resistant and 100% waterproof. Two standard C-cell batteries provide hours of cordless operation, and standard features like a serial data port, in-scope display, and an adjustable shoulder rest make the UltraLyte road ready for a patrol car or motorcycle. 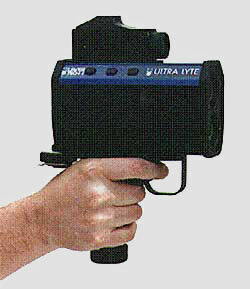 This multi-function laser offers solutions beyond speed enforcement. An optional electronic tilt sensor enables height readings for tactical operations, along with slope corrected distance measurements for accurate accident reconstruction. The UltraLyte works directly with LTI's patented QuickMap accident investigation system, as well as our SpeedStat traffic statistics package. Used to its fullest, the UltraLyte becomes an indispensable tool throughout the department. Add laser's versatility to your traffic safety program--economically. With the UltraLyte, lasers have never been lighter on the budget. Now you can put the best equipment into the hands of your busiest personnel, and not compromise on quality. Only with the UltraLyte. Only from Laser Technology. For increased maximum range capability, be sure to check out the UltraLyte LR, which acquires targets out to 3,280 feet! Rugged, waterproof, shock-resistant aluminum housing weighs in at less than 3 lbs. and is balanced to operate effortlessly in one hand. Menu-driven LCD display provides easy user operation. Backlit for night use. Fire single shots, or switch to continuous readout mode for rapid speed updates. Survey mode provides superior range accuracy for accident investigation. When necessary, use range and speed gating to ensure target readings are only within your specified work area. On-board computer calculates speed and distance at the touch of a button. Slope, horizontal distance, and height are available with an optional tilt sensor. UltraLyte interfaces with QuickMap, LTI's exclusive traffic accident and crime scene mapping software, and SpeedStat, LTI's traffic statistics package. Inclination Limits: +/- 180 deg. Inclination Accuracy: +/- 0.1 deg. typ.